This page illustrates the Apache Spark MLlib library with the plain-vanilla K-means clustering (unsupervised) algorithm. 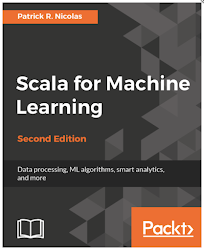 Apache Spark attempts to address the limitation of Hadoop in terms of performance and real-time processing by implementing in-memory iterative computing, which is critical to most discriminative machine learning algorithms. Numerous benchmark tests have been performed and published to evaluate the performance improvement of Spark relative to Hadoop. In case of iterative algorithms, the time per iteration can be reduced by a ratio of 1:10 or more. The core element of Spark is Resilient Distributed Datasets (RDD), which is a collection of elements partitioned across the nodes of a cluster and/or CPU cores of servers. An RDD can be created from local data structures such as list, array or hash tables, from the local file system or the Hadoop distributed file system (HDFS). Note: The code presented in this post uses Apache Spark version 1.3.1. There is no guarantee that the implementation of the K-means in this post will be compatible with future version of Apache Spark. An RDD can persist, be serialized and cached for future computation. Spark provides a large array of pre-built transforms and actions which go well beyond the basic map-reduce paradigm. Those methods on RDDs are a natural extension of the Scala collections making code migration seamless for Scala developers. Apache Spark supports fault-tolerant operations by allowing RDDs to persist both in memory and in the file systems. Persistency enables automatic recovery from node failures. The resiliency of Spark relies on the supervisory strategy of the underlying Akka actors, the persistency of their mailboxes and replication schemes of HDFS. Data generator for K-means, logistic regression and support vector machines. The machine learning byte code is conveniently included in the spark assembly jar file built with the simple build tool, sbt. Updating to latest technology is one's responsibility. Article like this are truly inspiring and worth able to read. You have done a great job by posting it in here. Thanks for sharing. Thanks of sharing this post…Python is the fastest growing language that helps to get your dream job in a developing area. It says every fundamental in a programming, so if you want to become a expertise in python get some training on that language. Does anyone know any good training in Chennai? I've searched high and low but haven't found anyone offering it. Great information shared. Really valuable tips, these kind of tips really helpful for me. MaxMunus Offer World Class Virtual Instructor led training on Apache Scala. We have industry expert trainer. We provide Training Material and Software Support. MaxMunus has successfully conducted 100000+ trainings in India, USA, UK, Australlia, Switzerland, Qatar, Saudi Arabia, Bangladesh, Bahrain and UAE etc. I read your article and it’s totally awesome. Keep updating this kind of useful information. thank you..
nice information. I enjoyed read the post. MaxMunus Offer World Class Virtual Instructor led training On APACHE SPARK . We have industry expert trainer. We provide Training Material and Software Support. MaxMunus has successfully conducted 100000+ trainings in India, USA, UK, Australlia, Switzerland, Qatar, Saudi Arabia, Bangladesh, Bahrain and UAE etc. Very interesting and informative post..Keep sharing.. Thanks a lot for sharing such an informative blog post. I really like your blog post. Nice post...thank you for sharing ..
Hi, Thanks for sharing with us. This is very helpful for me. Your blog is very informative. Big data hadoop tutorial is very useful for my work. Keep up the good work.